Tata Harrier has now been launched in India at an attractive price of Rs 12.7 lakhs. Launched at a starting price of Rs 12.7 lakhs, Tata Harrier boasts of a legendary pedigree and is set to create new benchmarks for SUVs. Looking at Harrier’s specs, it’s clear that Tata Motors has worked hard to create a world-class SUV with significant potential to take on rivals. 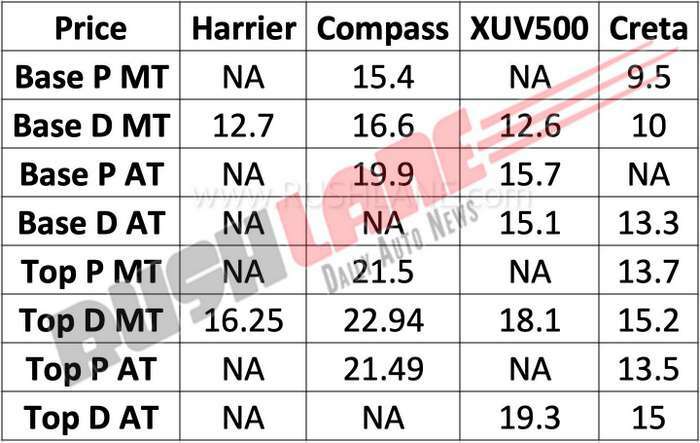 Here’s a quick comparison between Tata Harrier price vs rivals Jeep Compass, Mahindra XUV500, Hyundai Creta, to understand which SUV would be the best SUV for you. Dimensions – Tata Harrier measures 4598 mm in length, 1894 mm in width, and 1706 mm in height. It has wheelbase of 2741 mm and ground clearance of 205 mm. Hyundai Creta measures 4270 mm in length, 1780 mm in width and 1665 mm in height. It has a wheelbase of 2590 mm. Jeep Compass is 4395 mm long, 1818 mm wide and 1640 mm in height. It has a wheelbase of 2636 mm. 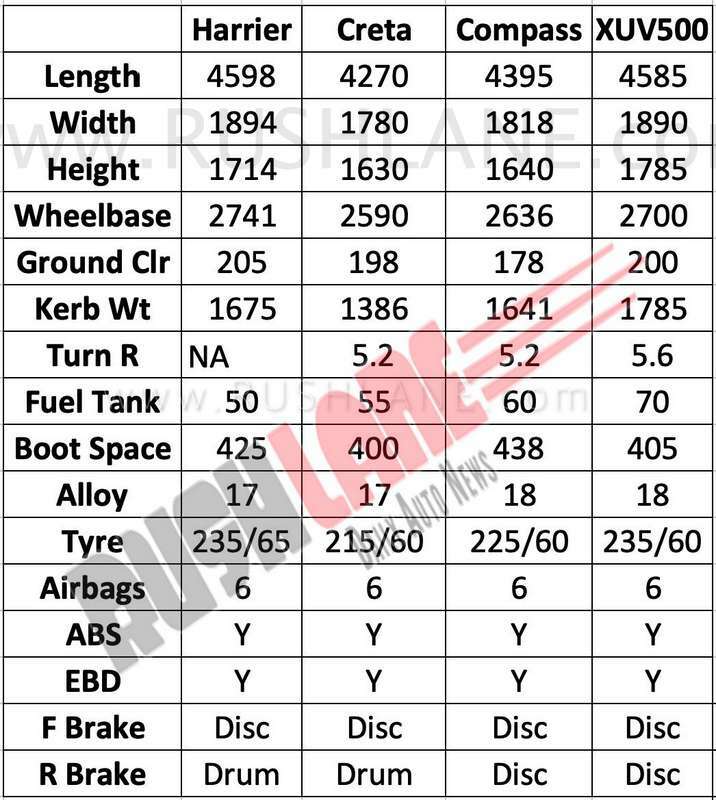 Mahindra XUV500 measures 4585 mm in length, 1890 mm in width, and 1785 mm in height. It has a wheelbase of 2700 mm. 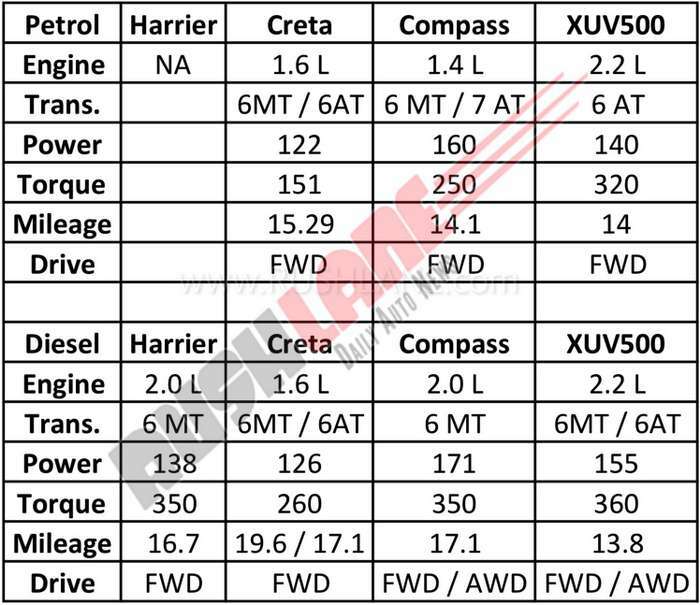 Tata Harrier mileage, engine specs vs rivals. Engine and transmission – Tata Harrier is powered by Kryotec, 1956 cc, 2.0L turbocharged diesel engine that delivers max power of 140 PS @ 3750 RPM and max torque of 350 Nm @ 1750-2500 RPM. Engine is mated to a 6-speed manual transmission. Hyundai Creta is available in two diesel options. The 1396cc, 1.4-litre diesel engine makes 90 PS power and is mated to 6-speed manual transmission. The 1582cc, 1.6-litre diesel engine makes 128 PS power and is mated to either a 6-speed manual or 6-speed automatic transmission. Jeep Compass diesel variant utilizes the same engine as that of Harrier, but it has been configured to deliver 173 PS power. Torque output is the same as Harrier at 350 Nm. Engine is mated to a 6-speed manual transmission. Mahindra XUV500 diesel variant is powered by 2179cc mHawk155 diesel engine that makes 155 HP @ 3750 rpm and 360 Nm @ 1750-2800 rpm. Engine is mated to 6-speed Synchromesh manual or 6-speed automatic transmission. Safety & security – Tata Harrier comes with high-end safety features such as 6 airbags, advanced Electronic Stability Program (ESP), ABS with EBD, corner stability control, electronic stability control, electronic traction control, hill hold control, roll over mitigation, hydraulic brake assist, hill descent control, ISOFIX child mounts, and reverse parking camera. Rivals Hyundai Creta, Jeep Compass and Mahindra XUV500 offer more or less the same set of safety and security features. 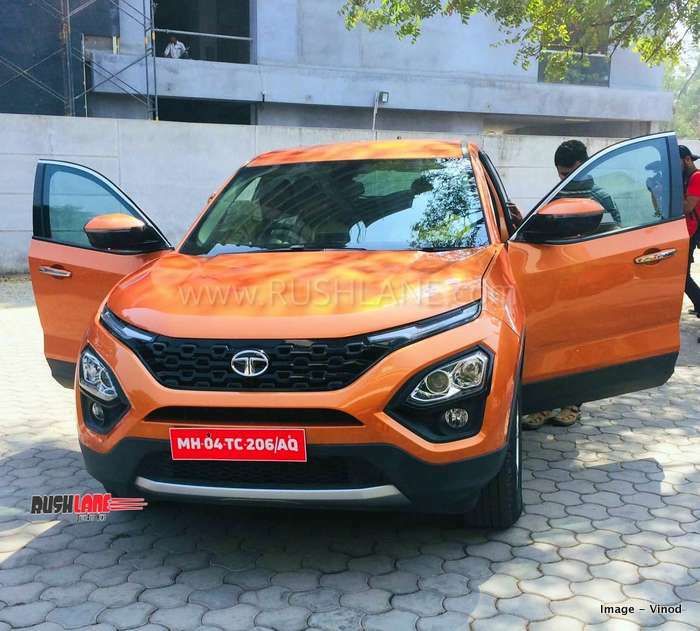 Price – Tata Harrier prices range from Rs 12.7 lakhs and goes all the way to Rs 16.25 lakhs. Hyundai Creta diesel, manual variant is priced in the range of Rs 10 lakh to Rs 15.17 lakh. Jeep Compass diesel, manual variant is priced between Rs 16.64 lakh and Rs 22.94 lakh. Mahindra XUV500 diesel, manual variant is priced in the range of Rs 12.62 lakh to Rs 18.12 lakh. All prices are ex-showroom. Verdict – Is Harrier for you? Tata Harrier comes across as a viable option in terms of design and styling, engine specs, performance and safety & security. Pricing too is aggressive. Harrier is based on Omega Arc platform derived from Land Rover’s D8 architecture, which makes it truly world class. It has been tested for over 2.2 million km, something that is evidence to its tough and durable nature. It is loaded with features and has the most spacious cabin. However, there is no petrol option, no automatic variant on diesel, no AWD / 4×4, no sunroof, alloys look a bit outdated, etc. For now, it attracts a limited set of buyers. Tata plans to launch launch more variants of the Harrier in the future, which will allow it to compete even better with rival SUVs.